Both the DOW and the S&P500 broke to new all-time highs last week despite the continuous US-China trade war and the on-going geopolitical tensions surrounding the United States, Russia, Iran, and Turkey. The real concern for U.S. stocks however, goes beyond these economic and geopolitical factors: we believe that the main problem remains Fed’s Balance Sheet, which has been shrinking since the beginning of the year. In our opinion this is why we saw that mini "flash crash" back in February 2018 as investors were spooked by the lack of liquidity in the markets. Some background: in an attempt to bounce back from the 2008 financial crisis, the US central bank kept buying assets bolstering the economy and igniting a 9-year bull trend for U.S. equities. With the Fed buying fixed income instruments investors naturally turned to equities as they were offering more favorable returns. However, now that the Fed is reversing its asset purchases program, market participants should look towards the safety of bonds especially if their yields offer comparable - if not higher - returns compared to dividends received from holding stocks. Where is Smart Money Going? 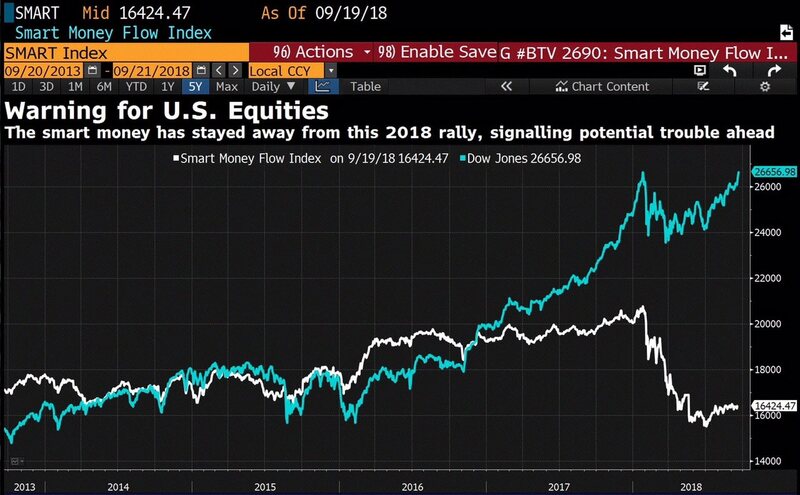 Another interesting chart is the Smart Money Flow Index, which measures the sentiment of the Smart Money (Financial Institutions, Hedge Funds, etc) in the market compared to the Dow Jones. Notice how the DJIA and the smart money index diverged going into a negative correlation as the Dow reached new highs while the smart money went under the mattresses. Not getting back in the market since the February crash, signals high uncertainty ahead in the U.S. equity market, at least for the so-called Smart Money. In the short-term outlook, investors are anxiously awaiting for the Federal Reserve's two-day monetary policy meeting ending on Wednesday, with economists expecting the central bank to raise interest rates by another quarter point. The accompanying statement is likely to attract considerable attention along with Fed Chairman Jerome Powell's press conference, as traders attempt to gauge the outlook for further rate hikes. But will U.S. stocks continue on this bull run? Will the DOW reach 30,000 in 2018 as predicted by some analysts? When it comes to the stock market, there is no secret formula that can definitively determine the direction of equities. In the end, investors basically just want to know what the best and brightest are doing with their money so they can mimic those strategies. Right now, the so-called smart money is saying run and hide! But What About U.K. Stocks? The FTSE 100 is being pushed and pulled by many factors, jumping from a positive to a negative correlation with the pound, while negative correlation is the norm as the index is dominated by exporters (more than 70%) which gain from a weaker currency since most of their revenue comes from overseas. The blue chip index started the month on the downside as Brexit talks took a negative turn, in addition to lower than expected UK retail sales data and energy stocks dropping with the price of oil. The FTSE then reached a 5-month low, weighed down by concerns of slowing growth in China and its impact on the index's global miners sector. The index held its ground as the pound registered higher highs in the second and third week of September, aided by higher commodity prices and less uncertainty in the global markets; that is less severe trade war retaliation than expected by China, and a positive market sentiment around the EU 27's meeting. The FTSE, along with the pound, crawled up as trade jitters were appeased and global equity markets surged, with the Dow and S&P500 registering new all-time highs. Strong negative correlation came back in play last week (September 20th) with the pound falling as the EU27 rejected PM May's Chequers plan. What Next for U.K. Stocks? Going forward, the aforementioned events are still developing, bombarding UK equities with mixed signals day in and day out. Despite the positive stock-specific news from major M&A's and the expected increase in oil prices, the ongoing U.S-China trade war along with Brexit developments will continue to be the main driver for the Blue Chip index over the short-term. For long-term investors however, we believe that risks associated with Brexit are already aggressively priced into domestic company valuations and, if the fundamentals of the company are strong, this offers investors excellent opportunities to acquire profitable stocks at attractive prices. There is a strong financial argument supporting UK stocks: on average, UK-listed companies are trading at 13 times earnings, compared to 18 in the US and EU making them the cheapest in the developed world. Moreover, the dividend yield in the UK is at a 15-year high versus global equities. Which means that by buying shares that pay dividends, you can receive almost three times the income compared to buying US-dividend paying stocks.